The cashew nut grows from the bottom of the cashew fruit of the cashew tree. Cashews growing on a tree in a tropical garden. Cashews are the nuts produced from the cashew tree. Cashew nuts are a favorite food item around the world, and they are packed with proteins, carbohydrates, and dietary fiber. While the consumption of cashews is popular in many countries around the world, about 6% of the global population is believed to be allergic to cashews which can trigger either mild or life-threatening allergic reactions. The cashew gets its name from the Portuguese term “caju” which is borrowed from the Tupian term “acaju” which translates to “the nut that is self-productive.” The binomial name of the cashew is “Anacardium” which originate from the Greek words “ana” and “kardia” which translate to “above heart” as a reference to the unusual positioning of the seed above the cashew fruit’s core (heart). The cashew tree is native to Brazil. The Portuguese were responsible for spreading the tree in other regions and introduced the cashew tree to India in the 1550s. From India, the tree spread all over Southeast Asia and finally reached West Africa. The cashew tree does well in the tropics between the 250 N and 250 S latitudes and is best-suited in regions which experience a long dry season. Other trees cultivated along with the cashew tree are the tamarind and mango trees which are also well-adapted to suit hot regions. The cashew tree is an evergreen plant having broad leather-textured leaves. The traditional cashew tree can grow to reach 46 feet tall. A notable exception is the Cashew Tree of Pirangi which is among the largest trees in the world. This gigantic cashew tree covers an area of over 81,000 square feet. However, the most widespread cashew tree is the dwarf cashew which grows to a height of only 20 feet. 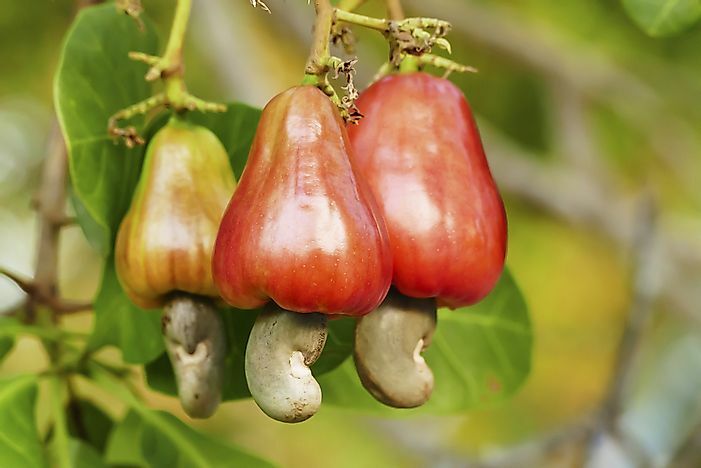 The popularity of the dwarf cashew is due to its profitability since it takes a short time to start fruiting (one year) compared to the traditional cashew tree which takes about three years to start fruiting. The global production of cashews reached more than 0.738 million tons in 2015. India and Cote d’Ivoire are the world’s largest and second-largest producers of cashews respectively, with the annual production in India being over 172,700 tons while Cote d’Ivoire produces more than 171,000 tons of cashews each year. The annual cashew production in Vietnam is over 113,000 tons, making it the world’s third-largest cashew producer and Brazil has the largest cashew production in the Americas, producing about 33,000 tons of cashews each year. In many countries, the nuts are consumed as a snack and are often prepared through roasting. In Indian cuisine, cashews are ground to powder form to be used in the preparation of desserts and sweets. The cashew fruit is also a tasty dietary item in many countries and is more popular than the cashew nut in Brazil. The fruit is usually blended to form a sweet fruit juice, but it can also be made into a dessert. The juice extracted from cashew fruits is also used in alcohol production after being fermented for a couple of days and later going through a double-distillation process. The resultant drink's alcohol percentage can be as much as 42%. The shells are an essential source of cashew shell oil, which is produced when cashew nuts are processed. Also known as the cashew nutshell liquid, the oil has numerous applications including being used as a pesticide in the treatment of wood. Cashew shell oil is also used in pharmaceuticals industries.